The Jalan Tun Razak/Jalan Pudu/ Jalan Cheras/ Jalan Chan Sow Lin interchange project is progressing well and will ease the bottleneck in the area by Dec 12. Project contractor System Engineering & Construction Sdn Bhd representative, who refused to be named, said road users would begin experiencing major traffic flow changes temporarily. “This is a temporary traffic diversion until Sept 14 when the elevated portions are completed and ready for use,” he said. He added that the traffic diversions (see graphic) was needed to place the cranes at the site. One of the major changes to take place is the relocation of the Jalan Nicholas/Jalan Cheras traffic lights further down the road near the church. This traffic light will facilitate U-turns for drivers from Jalan Pudu to Jalan Chan Sow Lin and Jalan Nicholas to Jalan Chan Sow Lin and Jalan Pudu. 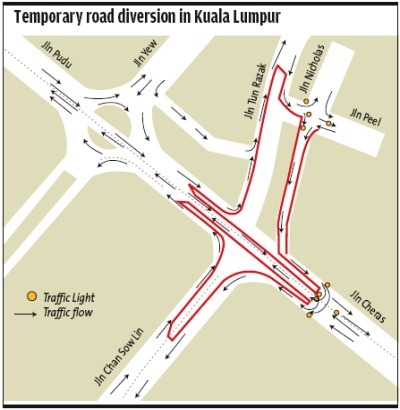 Those from Jalan Chan Sow Lin will only be able to make a left turn towards Jalan Pudu where they will have to take the Pudu roundabout to get to Jalan Tun Razak or Jalan Cheras. Drivers along Jalan Tun Razak will be diverted onto Jalan Nicholas, that will be converted into a one-way road for this period. Finally, those from Jalan Pudu will be able to go straight towards Jalan Cheras but to get to Jalan Chan Sow Lin, they will have to go along Jalan Tun Razak, Jalan Nicholas and make the U-turn at the relocated traffic lights in Jalan Cheras. The representative went on to say that they will be working round the clock to meet the deadline. “Once the elevated portion is completed, we will be concentrating on the Jalan Pudu/Jalan Cheras underpass. Right now, we are preparing a report to Kuala Lumpur City Hall (DBKL) to inform them of a height problem for the underpass,” he said. He said the underpass they were constructing had a difference height clearance than the one that already exists along Jalan Pudu leading into the city. “The underpass we are building has a 4.5m height clearance, enough for all vehicles but our contract states we need to increase this to 5.2m. The lower clearance of the existing underpass is 3.7m and there are concerns certain vehicles may not be able to pass through,” he said. Their suggestion to solve this is to either abandon the need to further increase the new underpass’ height clearance or increase the height clearance of the old underpass. He also explained the reasons for the project’s three-year completion delay since August 2009. “We were still going through land acquisition for the project until August last year. So far, we have acquired more than 20 shophouses. “There was also a number of underground utility pipes we had to deal with,” he said. He added that they had to get the approval of the Smart management as part of the tunnel ran under their project and this took two years. “So far, our cost overrun is about RM5mil.” he said, adding that they have already received two contract extensions for the project and are preparing to apply for a third as the current one expires on Sept 14. Cheras MP Tan Kok Wai said the project costs RM100mil, including land acquisition. “This project is meant to provide a better traffic dispersal system and ease the bottleneck on this interchange that has caused massive congestion during peak hours. “I have received many complaints from my constituents on this project so I hope it will be completed soon,” he said.